Where to Buy Tomahawk Excluder E50, Tomahawk Live Trap Excluder E50 - 12 X 5 X 5 - $38.95 for Sale with Fast Free Shipping! Tomahawk Live Trap Excluder E50 - 12 X 5 X 5 is designed to let squirrels, rats and similar size animals remove themselves from unwanted areas. The one way door lets animals exit and prevents them from entering. 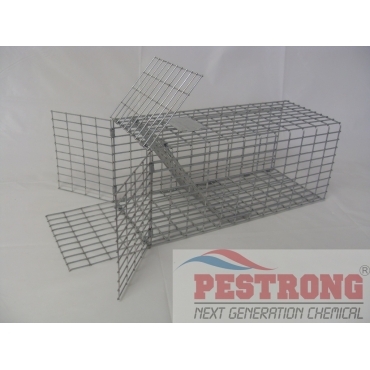 It can be used for rat, mice, shrews, voles, chipmunks, or other small rodents. A simple solution to pests in the house. I use these on an open window and place some bait on the outside of it. Whatever I am trying to remove from my house will have to go through the excluder's one way trap door to get at its delicious wares, but once it does it can no longer go back in. It's now forced to leave and go where it belongs in the wildlife. This is a simple solution for those that don't want to invest in the pricier cage traps. And you do not have to take this somewhere to relocate the animals.